Welcome to the College of Charleston Transfer Resource Center! The Transfer Resource Center (TRC) is the College of Charleston's space for all things transfer. If you're a prospective, admitted, or current student looking to make your credits and time at the College count, it's time to connect with the Transfer Resource Center. Be sure to check out the many resources available to you, information about getting involved as a transfer student, and important information about transfer credits. Visit the TRC in the Lightsey Center Suite 258, follow us on Instagram, and like our Facebook page! How will my credits transfer? Use Transferology and find out! Are you a current student and have a quick question for the TRC? 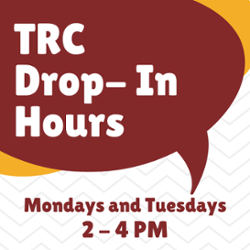 Stop by during Drop-In hours!